At some point, Las Vegas is on everyone’s places to see bucket list and we agree it is one of “The Places To See”! While planning for your Vegas getaway, you might have casino brain but want to remind you there is so much more too see in the City of Lights to be seen. We encourage you to just get out there and head down the strip for a little fun, see Elvis, then venture on to other parts of the city that will leave you will lasting memories, happy ones too! While you are there, let us help you save a little money with these Las Vegas Deals on our favorite attractions. Voted the “Most Unique Family Attraction” in Las Vegas! Experience the thrill of skydiving without an airplane without the terror of actual doing it. 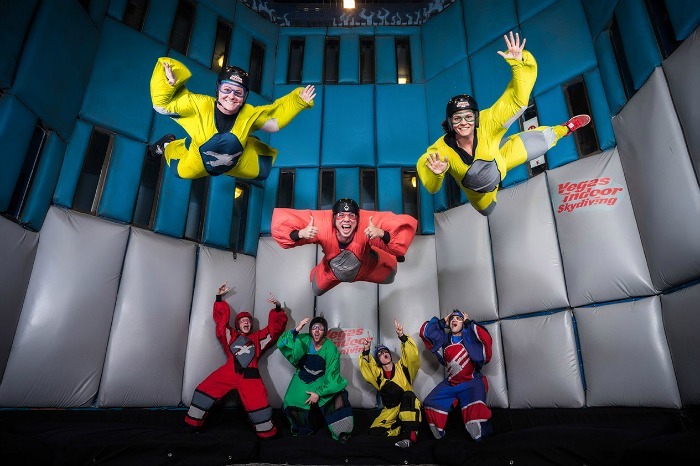 Vegas Indoor Skydiving is a vertical wind tunnel that simulates the freefall aspect of skydiving. You will laugh, maybe cry and just have a great time. So what are you waiting for? Come fly with us! Vegas Indoor Skydiving has no age limit and no height requirements! A true fun for the entire family experience. Plus, this attraction carries a rating of 4.5 stars on TripAdvisor! With cutting-edge content spread throughout an immaculately restored U.S. Post Office and Courthouse built in the 1930s, The Mob Museum, the National Museum of Organized Crime and Law Enforcement, provides a world-class, interactive journey through true stories of organized crime and law enforcement. Its high-tech theater presentations, immersive storytelling, over 2,000 iconic one-of-a-kind artifacts and interactive exhibits engage a Mob Museum guest in a one-of-a-kind experience. Visitors can actually listen to FBI wiretapped recordings, see a portion of the St. Valentine’s Day Massacre wall, learn about hearings involving organized crime in a courtroom where they literally took place, travel back in time to understand the social conditions that led to the rise of the Mob and discover how organized crime continues to fill the headlines today. With visitors from all 50 states and more than 36 countries, The Mob Museum continues to accumulate awards and accolades from around the globe including being ranked #19 Museum in the U.S. by Trip Advisor, winner of city, state and national Best Museum awards! 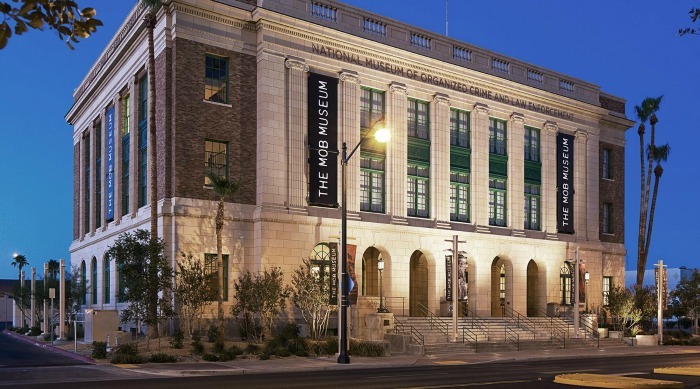 Critically acclaimed, unflinchingly unique, globally respected and beloved by locals, The Mob Museum, the National Museum of Organized Crime and Law Enforcement, in downtown Las Vegas reveals an insider’s look at the events and characters of the continuing battle between the Mob and the law. The Museum offers a provocative, contemporary look at this fascinating topic through high-tech theater presentations, more than 2,000 iconic one-of-a-kind artifacts and interactive exhibits. $10 off any Full Price Ticket ~ Cannot be combined with any other offers. No Cash Value. Flightlinez Bootleg Canyon is located on the Red Mountains in Boulder City. just 30 minutes outside of Las Vegas. You will discover breathtaking views of Las Vegas, Lake Mead, and the Eldorado Valley, while the eco-tourism guides take you on an interpretive journey over the desert ecosystem. The system is compiled of 4 separate runs carrying you over 1.5 miles of the Mojave Desert floor at speeds up to 60 mph. Flightlinez Bootleg Canyon has been featured on the Travel Channel with Bert the Conqueror, Fantasy Factory and MTV among others. You don’t want to miss this amazing experience. Complimentary transportation available from the LV Strip. Office is open daily from 8am-5pm. Calling all crime scene investigator wannabes! If you ever had the itch to become a crime scene investigator but never got a chance to test out your skills, this is your perfect opportunity. 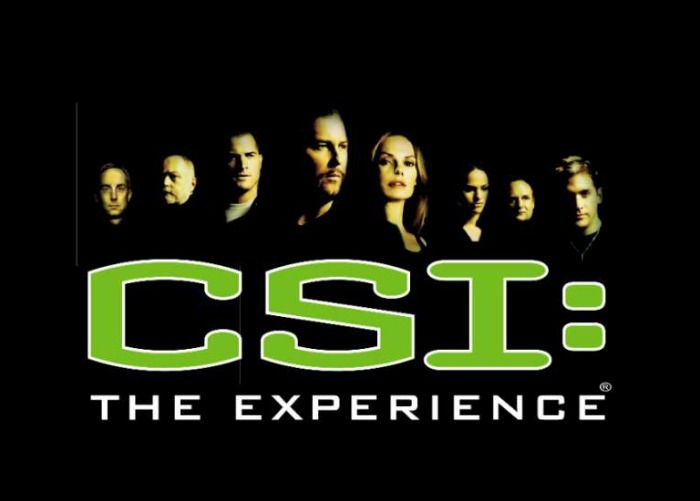 Become a member of the elite Crime Scene Investigations Unit in the thrilling CSI: The Experience at MGM Grand, which brings the megahit TV show to life. You’ll be tasked with solving one of three separate murders with a bare minimum of evidence to do so… but don’t worry, characters from the hit series CSI: Crime Scene Investigation will guide you along the way in interactive video presentations. You’ll collect evidence at your crime scene, which you’ll take back to two state of the art crime labs where you’ll use advanced forensic techniques to analyze bullet casings, make DNA matches and identify a suspect from a single piece of hair. The Range 702 is the ultimate shooting experience in Las Vegas and very local friendly. Some might say it is a true one stop shop for all! They offer a full retail store with all the firearms, accessories, holsters and ammunition you could only dream of. Complete with educational classes including Intro to handguns, shotguns, CCW permits and many more. Onsite gunsmith is available to assist you with your needs. Not to mention the VIP Suite for birthday parties and events. Plus they only deliver the best with purified and air conditioned indoor shooting lanes where you can bring your own firearms or shoot ours.